Austin Wayne Self will drive for Niece Motorsports full-time in the NASCAR Camping World Truck Series in 2018, according to an announcement from the race team. Self has 38-career starts in the Truck Series between 2016 and 2017, including 16 of the 21 races, so far, this year. In four of those 16 races this year, he drove for Niece Motorsports. Self has one-career top-five finish, a second at Daytona (Fla.) International Speedway in the 2017 season-opener. He has three-career top-10s. His best finishes, to date, with Niece Motorsports were two 15th-place finishes this season at Texas Motor Speedway last weekend at at Kansas Speedway earlier in the year. Aside from Self, Niece Motorsports has put drivers including Jeffrey Abbey, T.J. Bell, Justin Fontaine, Victor Gonzalez Jr. and Travis Pastrana in its trucks this year, running its No. 45 full-time and entering the No. 38 in two races as a second entry. The team’s best finishes, so far, were four 14th-place finishes this year, three of them with Bell and one with Abbey behind the wheel. 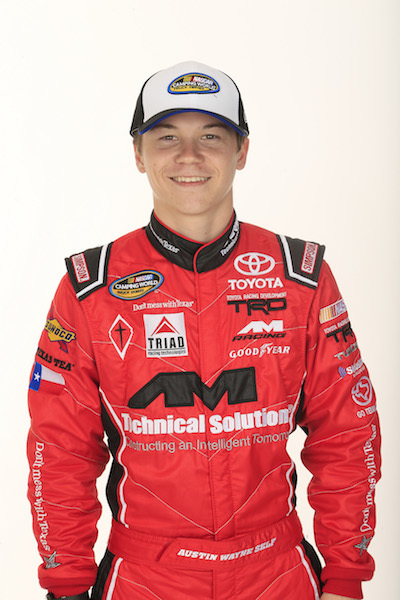 In all, the team has 23 Truck Series starts to its credit, all but one of them coming this year. The team’s debut came last year at Texas Motor Speedway.